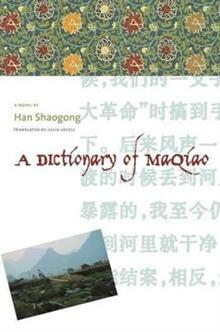 Maqiao (Huanan Sheng, China) - Fiction. One of the most-talked about works of fiction to emerge from China in recent years, this novel about an urban youth "displaced" to a small village in rural China during the Cultural Revolution is a fictionalized portrait of the author's own experience as a young man. Han Shaogong was one of millions of students relocated from cities and towns to live and work alongside peasant farmers in an effort to create a classless society. Translated into English for the first time, Han's novel is an exciting experiment in form -- structured as a dictionary of the Maqiao dialect -- through which he seeks to understand and translate the local life and customs of his strange new home. Han encounters an upside-down world among the people of Maqiao: a con man dupes his neighbors into thinking that he has found the fountain of youth by convincing them that his father is in fact his son; to be scientific" is to be lazy; time and relationships are understood using the language of food and its preparation; and to die young is considered "sweet," while the aged reckon their lives to be "cheap. "As entries build one upon another, Han meditates on the ability of a waidi ren (outsider) to represent the ways of life of another community. In this light, the Communist effort to control the language and history of a people whose words and past are bound together in ineluctably local ways emerges as an often comical, sometimes tragic exercise in miscommunication. Han Shaogong is an award-winning novelist, essayist, and translator. He is author of Moon Orchid (1985), Bababa (1985), Womanwomanwoman (1985), and Deserted City (1989). He is also former editor of the magazines Hainan Review and Frontiers, and is vice-chairman of the Hainan Writer's Association.